Warning: Very minor spoilers ahead! In a recent GDC interview with G4, Quantic Dream's David Cage revealed that describing the experience of Heavy Rain to people over the last two years has been his personal nightmare. Each button on the PS3 controller corresponds to different actions at different times, so it is difficult to assess what is "done" with any consistency. Yet the game does explicitly seek to evoke a wide range of emotions from players with these controls. What players "do" or "should do" is have an emotional connection to the story through interactivity. My goal with this post is to explore this attempt at evocative player inputs. I should start with a few caveats. There has been some debate about how suitable it is to call Heavy Rain a "game" at all. David Cage himself calls it an "interactive drama." The distinction, as I see it, is utterly pointless. If you thirst for more debate, I cede the floor to Chris Lepine of The Artful Gamer who recently posted an excellent piece on the subject. I am also steering clear of plot criticisms, including the affect player death has on the experience. That being said, story elements will arise whose effectiveness you question. In which case, consider my arguments on controls indicative of what QD would have achieved with better storytelling. In response to those who criticize Heavy Rain as a glorified collection of quick-time events, I side with Mitch Krpata of Insult Swordfighting on this when he says "This is factually true, and experientially insignificant." Like all game interfaces, the input options are abstract symbols for what appears on screen. 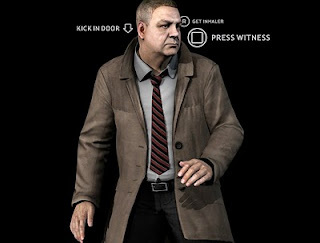 I take as my assumption the legitimacy of Heavy Rain's input design choices and go from there. To begin with, there are a few important differences between the types of player interactions. A vast sum of the game is spent maneuvering characters about their day to day lives, participating leisurely in the mundane. Actions are contextual. Opening a door might require moving the thumb stick right. Alternatively, swiveling the thumb stick might turn a car's key in the ignition for example. Gentler tasks require slower actions, and sustained effort might require tapping on a button repeatedly. More difficult tasks, such as climbing a muddy hill, might require the player to hold down buttons in a particular order. Lastly, during particularly fast-paced scenes, quick button presses play out quick-time events. There have been some criticisms levied at Heavy Rain for its interactive tedium, particularly the game's slow start. It does seem a bit ludicrous to brush someone's teeth with the thumb stick. Some of these early scenes, however, can be quite emotionally affecting. During the game's early moments, Ethan has a mock sword fight with one of his children. The battle prompts the player to parry and strike to win. You might, however, resist all your gaming knowledge and intentionally lose, ignoring the on screen instructions, to be a better father. As such, Heavy Rain conveys "failure" as a legitimate narrative outcome. More importantly for this scene, player input defines the emotional weight of the on-screen father-son relationship. Additionally, the game's basic interactions are designed to contrast with the game's high tension moments. Theoretically, partaking in Ethan's daily routine of caring for his son emphasizes his normality. Fixing your son something to eat before bed time is a far cry from the heroics of champions traditionally found in videogames. Therefor, we should empathize with him more easily. To some extent, this interactive banality also maps the human body across situations. We are reminded that the same limbs, or controller inputs in this case, we use to kick a ball might, in the right situation, save a life. The realism this conveys stresses the emotional level non-normative scenarios evoke. When tied to narrative outcomes, implementing the now normalized controller movements correctly suddenly becomes very important. In one dramatic scene, Ethan is giving CPR to his son Shaun. There were numerous moments when I, and Ethan by extension, had messed up basic everyday things, like carrying groceries. So, when a life depended on success, the possibility of failure was almost palpable. My only thought was "not now. Don't mess up now." The sense of tension and worry was far more powerful because my input mirrored routine interactions practiced earlier in the game. This same relationship plays out on many occasions. When FBI agent Jaden is reeling under the effects of Triptocaine (or ARI?) withdrawal, button options vibrate violently and blur. Players are met with the same disorientation Jaden is feeling, making success that much more difficult. Complex actions require complex button sequences as well, mimicking the concentration and contortion required to pull something off. At one point, I was holding down the left trigger with my lip. Similarly, when Madison is being assaulted with a bat, the appropriate button to dodge is actually attached to the object. Interpreting and acting upon this button display requires quick thinking. By contextualizing interface placement and adjusting its appearance based on character emotions, Heavy Rain creates stronger sensations of anxiety and tension. Our interactions with the game become colored by the emotions of the players, the actions on screen, and our own building distress. Some have criticized the game for this behavior, suggesting this design choice breaks immersion, requiring the player to think only of the controller. I do concede there is some preparatory controller memorization during some scenes. However, I equate such behavior to a goalkeeper mentally concentrating on their body, muscles, and inevitable movement seconds before a penalty kick. It is unfortunate, in this case, we concentrate so heavily on a controller, but the reason is the same. We mentally prepare ourselves to act correctly and efficiently during moments of high anxiety, which Heavy Rain successfully creates. There is one scene that is particularly evocative, which also collects input options successfully. One of Ethan's trials to save his son involves chopping off his own finger. Ethan may collect various items to prepare himself for the amputation. 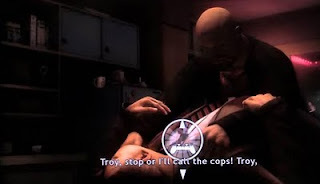 If they so choose, players follow Ethan, moving the six-axis controller to pull a knife out of the wall, rotating the thumb stick to heat up an improvised cauterizing iron, or slowly moving the stick up and down to regulate breathing and slow Ethan's heart rate. If players do this, they partake in a ritual of sorts. While it calms Ethan, it actually builds up tension for the player, asking them to imagine themselves in the same scenario. Each mundane task carries greater weight because each step brings players closer to the horrendous act. The scene creates a sense of determination, resolve, and disgust. Even if the only interaction the player indulges in is sawing through finger bone, the controller movement approximates and emphasizes the actual act. Players are encouraged to ponder the dilemma, stew within the emotions it creates, and face the grotesque challenge. Despite its digital nature, the sequence of events is incredibly cringe worthy. 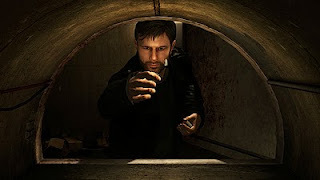 This scene epitomizes Heavy Rain's attempt at developing emotions with their game mechanics. For many people, Heavy Rain fails to evoke anything but frustration and disappointment. The way players interact with the game is partially to blame. It is not always clear why certain actions are mapped to certain inputs, or why that mapping changes during a scene. Undoubtedly, the interactive tedium also confounds the emotions players are supposed to feel during high tension situations. While the game is not perfect, it does tread an innovative path with its controls. David Cage intended to make an emotionally dramatic interactive experience. Regardless of its success, the attempt is an intriguing and commendable addition to emotional and sensational gaming. You said everything I could have wanted to say about the interface. I think it's a perfect exectusion and use of the particular traits of our mediuem to match the emotional and thematic moments of the narrative. During the third trial I spend a minutes doing the breathing, because I kept messing up and the input was shaking. I thought that meant Ethan would screw up. And after I did it, I cringed and dropped the controller. Because of the way the interface pulls you in, you feel far more from that single instance of violence than the blood spattered remains of a hundrand alien facist races. People complain about a lot of things in this game they wouldn't look at twice in any other. The brushing the teeth aspect or the groceries, those are all tutorials. That whole beginning sequence is a tutorial level. No one would comment twice about that if it was a normal game. Like Mitch Krapta said, the core elements of the action sequences are pretty much the same. They are just presented differently. Actually, given their context I think they are done better than some othr games. We can debate what Heavy Rain is or isn't, but it's the experience it imparts that is important. I think I've wandered a bit from the main point I was making. Jorge - Great stuff! This captures exactly what I thought Heavy Rain excelled at, without being gripey, as has become the common trope among most bloggers. These 'sensationalist' posts always bring me back to what's really important in a game. "However, I equate such behavior to a goalkeeper mentally concentrating on their body, muscles, and inevitable movement seconds before a penalty kick... We mentally prepare ourselves to act correctly and efficiently during moments of high anxiety, which Heavy Rain successfully creates." That point - the way you've said it - is high praise for HR, and I suspect captures the exact feeling that Quantic Dream was trying to express throughout. I don't see any of my criticisms of HR's interactive design to be critiques of HR itself, but rather a critique of the conventions of gameplay that designers have come to embrace. I suspect that it's a game that I'll want to come back to in a year or two, and try to 'live it' differently than I did the first time. I wanted to badly to mention the tutorial part too. I thought it was so weird people complained about shaving and brushing your teeth, or even not letting you go downstairs. Maybe its a bit rough but, and you are right, people wouldn't complain about this normally. Some scenes can be egregious, I admit, but not as many as some would have us belief. I'm glad someone digs the Sensationalist posts. I love writing them. 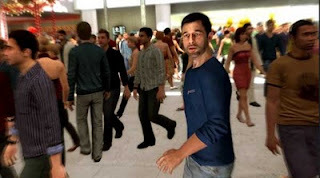 I'm actually eager to watch someone else play Heavy Rain. i cant add much more than you said about the controls, just that they sometimes have been a bit tedious, with having played fahrenheit before you are kind of used to the system. it personally didnt bother me, that the controls changed sometimes, it was jsut perfect for building tension. you never knew beforehand what you would have to do. the tutorial part was also nicely done imo, the problem is that most dont look at it as a tutorial. sometimes i think you really have to tell ppl _everything_. 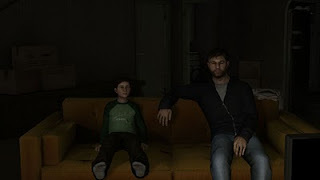 the other point, as you also said was building more of a connection between us the player, ethan and his sons and it did that. if HR is a game or not is surely discussable but i think we all can agree on it being one of the best stories ever told through a game and im looking forward to more of that to come in the future. i watched somebody play HR, actually i played it together with my brother. we switched back and forth playing different scenes but on our first play through we didnt re-do any of them. we agreed first on that and on "that the one who plays makes the decision". that was good and bad at once, as sometimes i thought "oh no, why didnt you choose this! i would have done that totally different...". the controlling itself looked quite crazy sometimes with more buttons to press than fingers or the moving of the controller itself, fun to watch though, especially if you know you could have messed up exactly that yourself. we didnt get the "good" end with that first play-through, it merely showed our ability with the controls, which havent been too bad, but more the choices weve done. so it kind of came out as a mixed personality of us playing. that was actually nice to follow but disturbing at once. Thanks for the excellent comment. I agree HR is one of the better adult stories told in games. Although after talking with Scott, I agree with him that I would love to see other storytellers besides David Cage try their hand at this sort of gameplay system. That's interesting that you played through the game with someone else. I was recently watching a friend play through the story of Mass Effect and it was infuriating watching Shepard make decisions I would not have chosen. Watching someone else play HR is neat, sharing the controls would be maddening. I wonder if your experience would have been different with each person playing exactly two characters, ie. your brother always playing as Shelby.